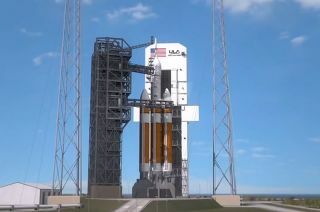 Artist's concept of a Delta 4 Heavy rocket standing poised on the pad ready to launch NASA's Exploration Flight Test-1 (EFT-1). The first flight of Orion is now slated for December 2014. NASA is developing a new spacecraft to take mankind to deep space, and high-school students will have an important role in designing it. The craft, called the Orion space capsule, is designed to take a new generation of astronauts to the moon, nearby asteroids and Mars. In December 2014, the spacecraft is scheduled to embark on an unmanned, 4-hour test mission, traveling to an altitude of 3,600 miles (5,793 kilometers). To do so successfully, however, the capsule will have to pass through the Van Allen Belt, a loop of charged particles trapped in the Earth's magnetic field. Without protection, the Van Allen radiation could damage some of the spacecraft's sensitive instruments. To learn more about how to protect Orion, teams of high-school students have been competing in the Exploration Design Challenge — sponsored by Lockheed Martin, NASA and the National Institute of Aerospace — to design a shield to guard Orion's radiation detector. Five final student teams are still in the running. They have been working with an assigned mentor to refine their designs and upload them into OLTARIS (the On-Line Tool for the Assessment of Radiation in Space) for virtual testing. The winning design will be announced at 8 a.m. EDT (1200 GMT) on April 25, and the chosen design will fly on Orion's first flight later this year. The Exploration Design Challenge "was launched on March 11, 2013, to give students from kindergarten through 12th grade the opportunity to play a unique role in the future of human spaceflight," NASA said in a statement. "The challenge encourages students in the U.S. and abroad to think and act like scientists and engineers to overcome one of the major hurdles for deep-space long-duration exploration: protecting astronauts and hardware from the dangers of space radiation," NASA officials added. So far, a total of 125,000 students from 81 countries around the world have participated in the challenge.